Many individuals don’t know more about frankincense than the story of three Magi bringing it as a gift on the day of Jesus Christ’s birth. The strong-smelling plant resin is often used today as an incense, but recent research shows it could have a far more significant value. In fact, a chemical compound in the resin could even trump chemotherapy in eliminating late-stage ovarian cancer cells. In the latest research, scientists have demonstrated the ability of frankincense to combat cancer cells in late-stage ovarian cancer. The findings offer yet another piece of evidence that the “cure” for cancer will not be found in toxic conventional treatments, but rather in the natural world. 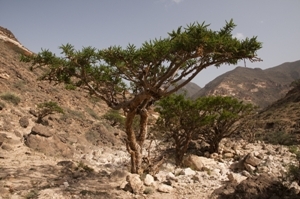 Frankincense is extracted from the Boswellia sacra tree and is found in Africa and Arabia. It’s been used for centuries as a folk medicine, largely because of its anti-inflammatory properties. The compound known as AKBA (acetyl-11-keto-beta-boswellic acid) is credited with many of the known benefits of the resin, including its positive effects on cancer elimination. Most impressive, the AKBA was even able to have an impact on cancer cells that were otherwise resistant to conventional treatment. ”What has been most surprising is that the cells we have tested which are resistant to chemotherapy have shown to be more sensitive to this compound, suggesting frankincense may indeed be able to help overcome drug resistance, and lead to an improved survival rate for patients with late-stage ovarian cancer,” Dr Mark Evans, Kamla’s PhD Supervisor and Lecturer in the University’s Department of Cancer Studies and Molecular Medicine said. But this isn’t the first study to suggest frankincense as a cancer treatment. Four years ago, the BBC reported from Salalah, where immunologist Mahmoud Suhail is working on the cancer-fighting properties of the ancient resin. Historically, frankincense has been used for relief from asthma, gastroenteritis, skin conditions, and more. But if research continues in the direction that it’s moving, we could see big things on the horizon for this tree resin.